Due to the extreme weather on the East Coast, Old Navy has decided to extend their 30% Off Friends & Family Event through August 31, 2011. With so many people not able to make it in to Old Navy, this will be really helpful. 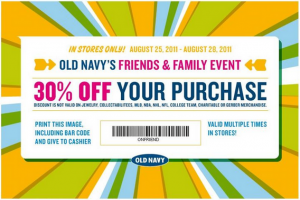 Make sure to print your Friends & Family coupon and head to Old Navy. Make sure to join the Faithful Provisions Community while you’re on Facebook.